I have been researching facts about history and there is strong evidence that what we were taught in school doesn’t fit with the reality. As you have a very vast coin collection, which is part of your research, how can you be sure of the timeline about those coins? I remember from your blog statements that many years are missing in the Japanese coinage and a very sudden drop in Roman silver minted coins. Greek, Roman and many other coins do not have any dates on them as we know it now. Is there any slight chance that years have been added to history by academia to fit their narrative? ANSWER: Greek coins are not dated. Most have been determined based upon the archaeological discoveries. Therefore, Greek coins cannot be specifically dated to an individual year. What can be determined is the sequence of rulers and we can determine date approximations often from contemporary writers. The lack of coins in Japan for nearly 600 years simply means that there is no Japanese numismatic record. However, foreign coins are discovered in Japan. Chinese coins were used because they were not devalued with each new emperor as was the case in Japan. There have even been Roman coins discovered in Japan confirming there must have been some trade connection albeit indirect. The Roman coinage is easy to date because Rome had overthrown the king and began the Republic during the 8th century BC. Therefore, an emperor was never portrayed as a “king” but maintained the pretense of being elected like our politicians today – the curse of a Republic. On the obverse of this Roman coin of Domitian (81-96AD), we see TR P VIII meaning this was the eight year of his reign since his Tribunicia Potestate – The Tribunician power, which had to be renewed each year as a pretence of being elected by the Senate, the same structure the EU today uses to appoint the head of the EU who never stands for public election either. 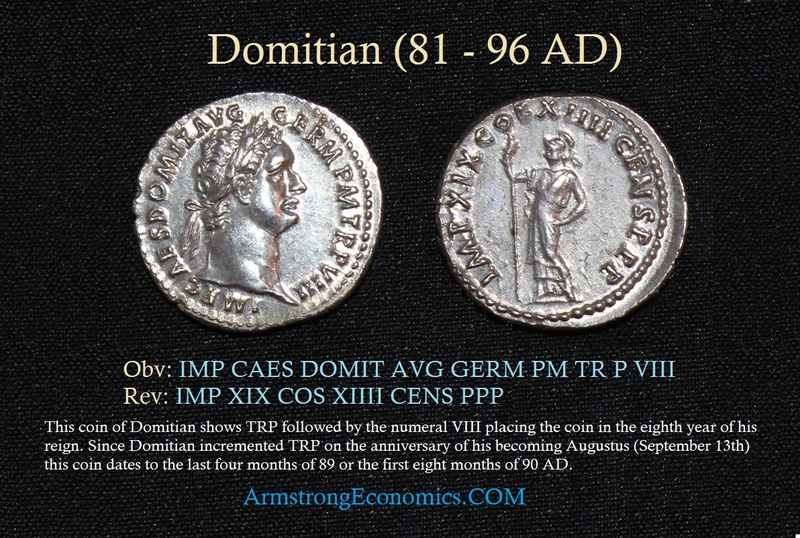 Domitian had served as consul with his brother Titus before he succeeded him as emperor following his death. Therefore, the reserve of the coin shows he was also the Consul serving for the XIIII (14th) time. Again, these are one-year terms. 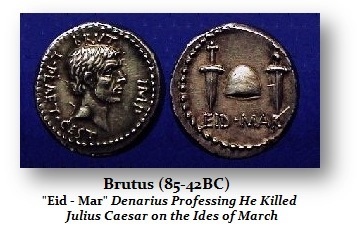 Here we have a coin of Brutus which boasts that he killed Julius Caesar on the Ides of March (15th) in 44 BC. 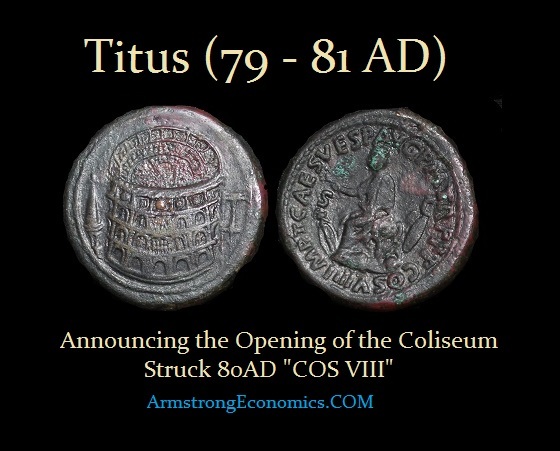 We also have a coin of Titus announcing the opening of the Coliseum. The Romans used the reverse side of their coins often as a newspaper announcing events and victories. The Greeks were interested in art. They competed for design, but they did not use the coins as a means of propaganda. This coin of Saturninus is probably one of the most important Roman coins ever discovered. The Latin work Historia Augusta was written during the reigns of Diocletian and Constantine I in the late 3rd century AD. The work recorded the lives of emperors and usurpers in Rome before Diocletian. It was a collection of thirty biographies. Of course, some academics pronounced it was a fake as they did with Homer because it listed people they never heard of during the collapse of the Roman Empire during the Monetary Crisis of the 3rd century. They challenged both the authorship of the work as well as its date ever since Hermann Dessau (1856-1931) whose claim to fame as a historian came in 1889 when he rejected both the date and the authorship the manuscript. He argued there were major problems that include the nature of the sources and how much of the content he claimed was pure fiction. He was proven completely wrong when this coin and one other coin was discovered in Egypt. 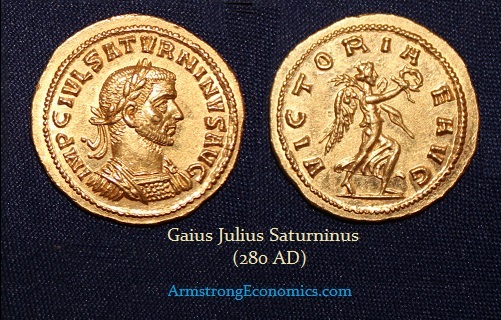 Saturninus was one of the names of a usurper he claimed never existed. 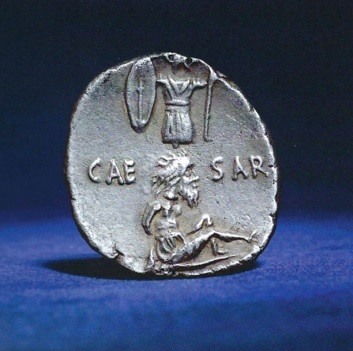 Here is a denarius of Julius Caesar showing a captive at the foot of a trophy. Note that the man has wild hair and a beard. It is believed that this coin represented the capture of Vercingetorix, the leader of the Gauls. Of course, the writings of Caesar and his conquest of Gaul have survived. Coins have in fact called into question recorded history. But academics far too often defend old interpretations and refuse to revise previous assumptions. For example, the very date that Vesuvius erupted burying Pompeii is by no means definitive although you will find August 24th, 79 AD as the date carved in stone. This date has been interpreted from a letter to the historian Tacitus some 25 years following the event. This was his old friend Pliny the Younger who provided an eye-witness account of the eruption. He states that the eruption took place on Nonum Kal September (the ninth day before the Kalends of September), which has been calculated as August 24th. However, Tacitus was translated during the 16th Century which remains questionable on many points. The ancient historian Cassius Dio directly states that the disaster took place “towards the end of the harvesting season” which would be in October, not August. The excavation of Pompeii revealed that the stores were selling fruit that would not have been seasonal for August. There were amphoras filled with wine after the harvest which had been sealed and ready for transportation and sale. Many of the people discovered were wearing warm clothing. That has been dismissed as they just wanted to cover themselves. But during excavations of Pompeii’s “House of the Gold Bracelet” in 1974, 180 silver and 40 gold coins were discovered with the bodies of a group of victims. 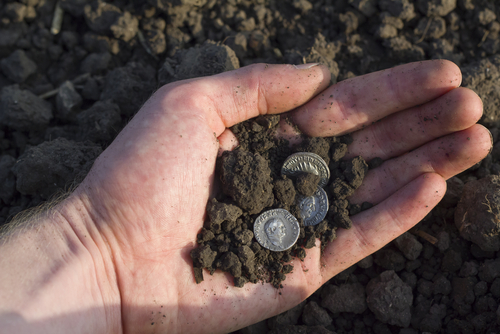 The coins were buried with the people attesting to their link with the eruption. The coins were never cataloged until 2006. There was one coin that confirmed that the date for the eruption of Pompeii was incorrect and that the account of Cassio Dio was closer to fact than Tacitus. Titus was emperor at the time of the eruption and he was remembered for the relief efforts. Titus’ administration was marked not by military or political conflicts, but by disasters. His first disaster was the eruption of Vesuvius. The eruption destroyed the cities and resort communities around the Bay of Naples in addition to Pompeii and Herculaneum which were buried under many feet of stone, ash, and lava. Titus appointed two ex-consuls to organize and coordinate the relief effort. He personally donated large amounts of money for the relief effort and he even personally toured the region the following year like presidents do today after such disasters (human nature never changes). 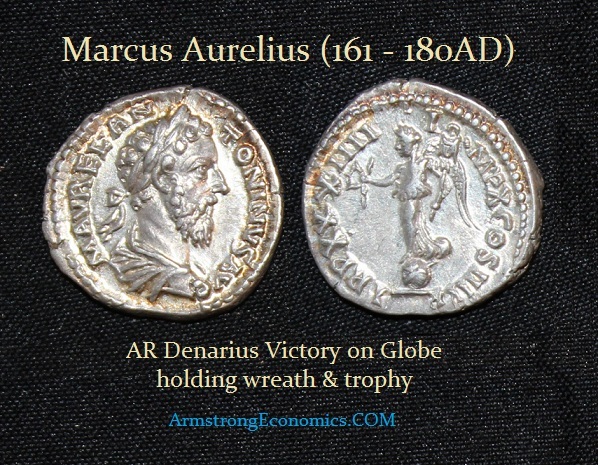 A single silver denarius was discovered among the 180 silver coins in 1974. When it was cataloged, it overturned history and has ever since been buried again in the Naples Museum rather than rewrite the history books. Titus’ father Vespasian died on June 24th, 79 AD. Therefore, any coin of Titus as emperor would have to have the very first recording of his power “IMP VIIII” or 8th Imperator, which was a title that meant ‘leader of the army’ to the Romans. The award was generally given at this point in history for a particularly important victory that was celebrated. In some cases, these subsequent awards, denoted by a numeral following IMP, which also allows dating of coins to a very short period. The coin discovered in Pompeii had the legend “IMP XV,” which was granted to Titus for the war in Britannia where he sent Gnaeus Julius Agricola who pushed further into Caledonia and managed to establish several forts there as recorded by Tacitus (Agricola 22). Therefore, Titus received this title of Imperator for the fifteenth time for this event, according to Cassius Dio (Roman History LXVI.20). This took place we know in September 79 AD about 3 months after becoming emperor following his father’s death. Obviously, if any coin was discovered in the ruins of Pompeii with “IMP XV” in its legend, then this provides absolute proof that the date for Vesuvius of August 24th, 79 AD cannot be correct. There are plenty of discoveries that have challenged the view of history. Roman swords have been discovered in Newfoundland for example. The Romans knew the world was round and NOT flat. They pictured a world that is round on countless coins. The one scepter that has survived from any Roman Emperor, Maxentius (306-312 AD), has a globe on it symbolizing that the Emperor ruled the entire world, which was a nice political boast. Strangely enough, the coins have documented history even when academics choose to try to ignore them rather than admitting they are wrong. It just seems that people do not want to ever admit making a mistake. The academics are no different than politicians, and even the Catholic Church tried to pretend there were no allegations that were valid against some priests. The problem with this posture is that as this policy is supported, they undermine the credibility of everyone in that profession. Academics are no exception. Just revise history and get on with it.